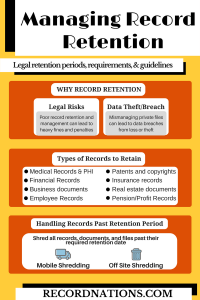 Record Retention Guide: Keep it or Shred it? With identity theft continually on the rise, causing billions of dollars in damages to businesses and individuals every year, it is important to know how long you need to keep your records and how to properly dispose of them. Holding onto copies of these documents can cause more harm than good because they contain information that identity thieves and corporate spies are looking to get their hands on. A thorough shredding protocol can certainly eliminate these concerns and keep your information and business protected. While some files should be kept in secure storage, others will need to be readily available, and in addition, there are other documents that should be destroyed immediately. While the retention periods and storage types of these documents can vary, they should all end up in a paper shredder at one point or another. It is important to hang on to documents such as vital records, birth records, death records, marriage, divorce, and adoption records. Investment statements including information regarding buying and selling should be kept, as should trust documents. Any audit or legal documents should also be held onto. For safekeeping, these documents should be kept in either a locked, safe box or a records storage facility. Many utility companies keep records of your statements online now so it is not worthwhile hanging onto gas or electric bills. If you can access any of your bills and records online easily, you can shred those documents. It may seem like an overwhelmingly large pile of documents to shred, in which case hiring a shredding service may be a good option for you. If you would like to personally witness the shredding of your documents, on-site (or mobile shredding) shredding could be a good option for you. Offsite shredding is also an option if you require a lot of shredding or are looking for a more cost-effective option. 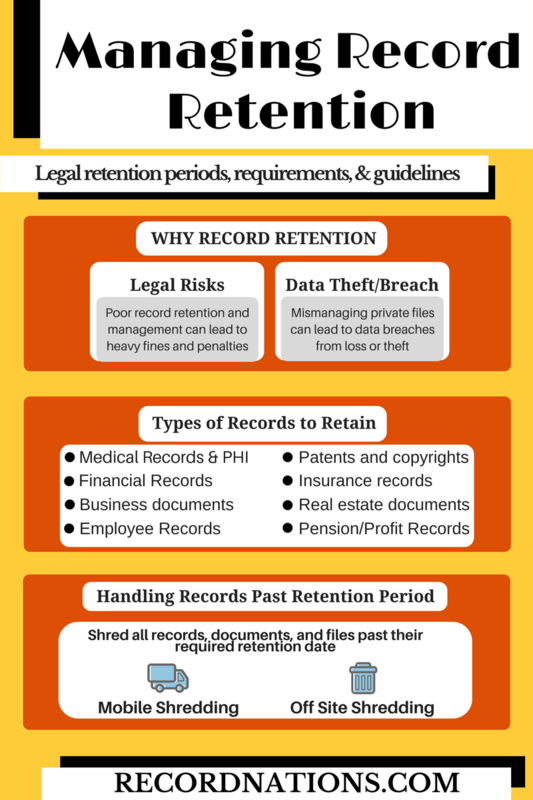 For more info on how long to retain records, take a look at this article. Record Nations connects you with document storage and management experts to keep your information safe and protected. Our experts can help you optimize and maintain your record storage needs, regardless of format or medium, guiding you through the entire transition process to a paperless office. To get free, no-obligation quotes in just minutes, fill out the form on the right or give us a call at (866) 385-3706.